Planters are wonderful, magical environments. Decorative, attractive, and easy to care for, just plant and forget. 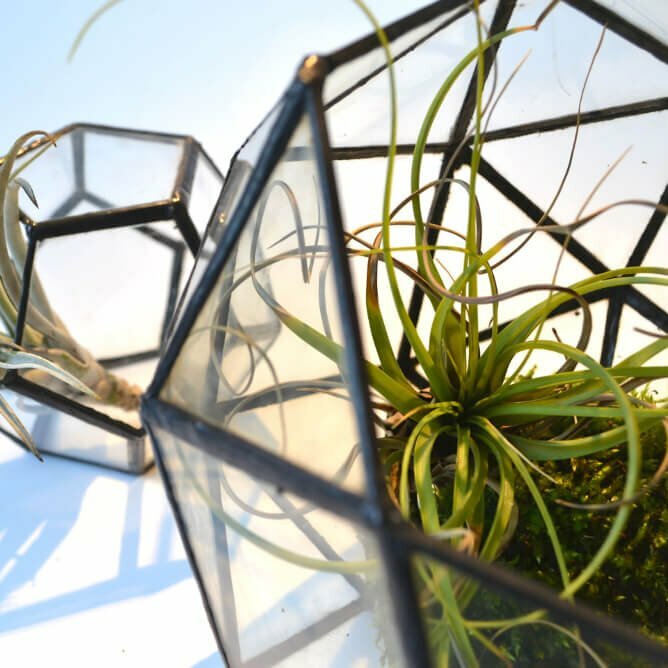 Because terrariums recycle their moisture, they need very little attention. 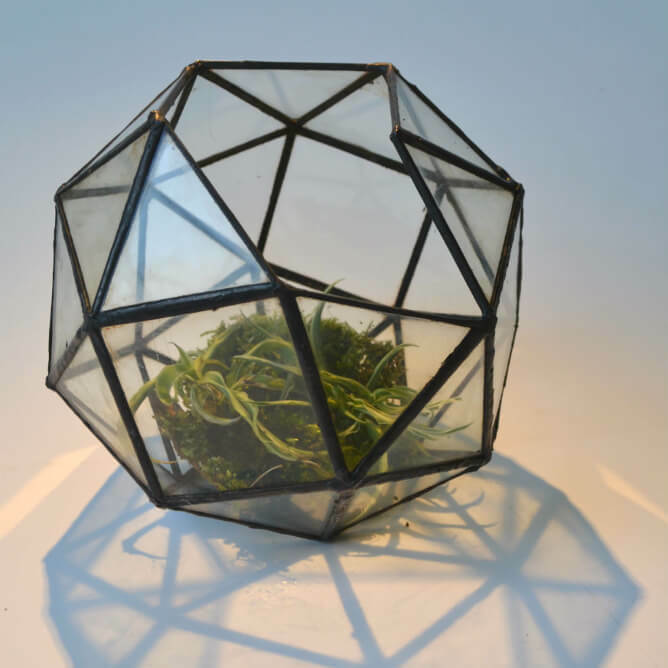 The sphere terrarium is a simple and elegant piece of stained glass thought as a planter. This piece of geometry is built using the copper foil technique. Every piece is cut on 2mm float glass. Once ground, cleaned and dried, it’s ready to be copper foiled. After that, it’s carefully soldered. The finish I use is a black patina, which enhances the contrast of the natural clear light and the drawing lines of the blackened solder. Then it’s cleaned, waxed and polished to appear in front of you ready to be enjoyed. I make every piece to order. So, any alteration in colour or shape can be done. Use the comments box at checkout to notify David of your preferences. Edinburgh-based David Mola is a versatile glass artist who has worked for many years with both stained and bespoke kiln-glass. Every piece that he makes is designed and made solely by him, they are each handcrafted and unique. As much as possible David recycles leftover glass, wasting as little as possible, and also enjoys experimenting with other materials and disciplines that he can bring in for contrast with the glass in his works. Current projects include incorporating cement, rocks, stray branches and lighting into his creations. Much of David's inspiration is derived from nature and distilled into simple structures and striking designs, and the works he creates are often intended to reintegrate with natural surroundings, at once harmonious and unexpected, never jarring.